WHY CAN’T NURSES RUN THE SHOW? Last week I reblogged Josephine Ensign’s Radical Hat-Burning Nurses Unite! because I was moved watching the Politics of Caring. The video, released in 1977, showed in Ensign’s words, “how little things have changed.” Nurses then were striking and joining unions in order to have “control over their jobs” and to promote safe and good nursing care. Ensign mentioned that some nurses, and I was one, left hospital nursing by becoming nurse practitioners or community nurses so they could enjoy autonomy not afforded in hospital nursing. In the 70s a friend of mine who already had a master’s degree in history and two school-aged children entered nursing school. After graduation, she worked only a year in a hospital, “paying her dues,” before she left for a desk job at an insurance company. She found the discrepancy between the culture and promise of nursing education and the reality of nursing practice—poor pay, lack of autonomy and hours that she had no control over—unacceptable. Also at this time, I had quit my job at a small community hospital south of Chicago when I discovered that a new grad received the same starting salary as I. She was assigned a seasoned nurse to mentor her for her first few months of employment—among other experiences she lacked, she had never inserted a Foley cath in nursing school—while I went directly to the medical intensive care unit. I wrote in my resignation letter that I felt this unfair. The Director of Nursing called me at home pressuring me to reconsider but didn’t offer me an increase in salary. I didn’t go back. Instead, I found a job in a nursing home that paid me more. A nurse who lived in the community ran the home and many of the residents came from the surrounding area. Most of the staff had been there for years. I loved working there and it was probably the reason I later specialized in geriatrics. Even though I had sworn not to work in a hospital again, I found myself on a neurology unit when I was in graduate school in-between semesters in the late 70s. I wrote a story about the experience (“Invisible.” Examined Life Journal, 2.1 Fall 2012:55-60.). While I was helping one of my patients get ready to go home, I realized she was still ill. I had the skills to diagnose her congestive heart failure but I didn’t have the power to delay her discharge. I had to call her doctor and tell him I thought she shouldn’t be sent home. It was the first time I deliberately avoided playing the old doctor-nurse game, which would be to suggest he some how was responsible for this decision. My intervention did delay her discharge so she could be treated, possibly preventing readmission and maybe even saving her life. What I did was something any nurse could have done. How many times do bedside nurses who know the patient best see signs of trouble coming and alert the doctors? But we rarely call attention to ourselves. And when the patient gets better and leaves the hospital who does the family think has made all the difference—the doctors. Getting back to that nursing home run by a nurse. 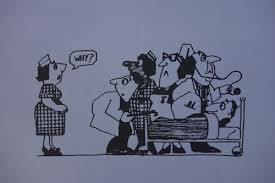 I have always played with the vision of nurses being in charge of a hospital and where doctors were the employees. I don’t have all the details worked out in my reverie but my hospital would let patients sleep at night without disruption for vital signs, lower noise levels in corridors, schedule tests around the circadian rhythm of the patients, serve tasteful, nutritious food and post prices of procedures and surgeries so patients would know what costs were attached to their care up front. No health professional (read doctors) would be allowed to throw a temper tantrum or refuse to follow infection control precautions. The “Nurse Hospital” wouldn’t have a nursing shortage. Why wouldn’t nurses want to work in an institution where they are appreciated and well paid and are included in decisions that affect their practice? And why wouldn’t patients want to be in a safe, patient-centered environment? 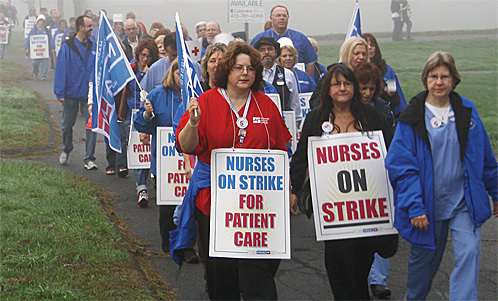 Nurses wouldn’t need to join unions to have control over their practice and provide good patient care. I love the image of hat-burning by nurses! It says so much that you point out in these wonderful essays of yours! I do hope nurses get the recognition they deserve even if they have to be “radical” to gain attention. Love your blog and the determination behind it!